First Performance on Wednesday and a Street Parade Tuesday. 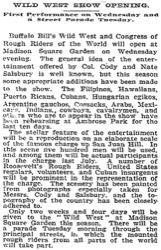 Buffalo Bill's Wild West and Congress of Rough Riders of the World will open at Madison Square Garden on Wednesday evening. The general idea of the entertainment offered by Col. Cody and Nate Salsbury is well known, but this season some appropriate additions have been made to the show. 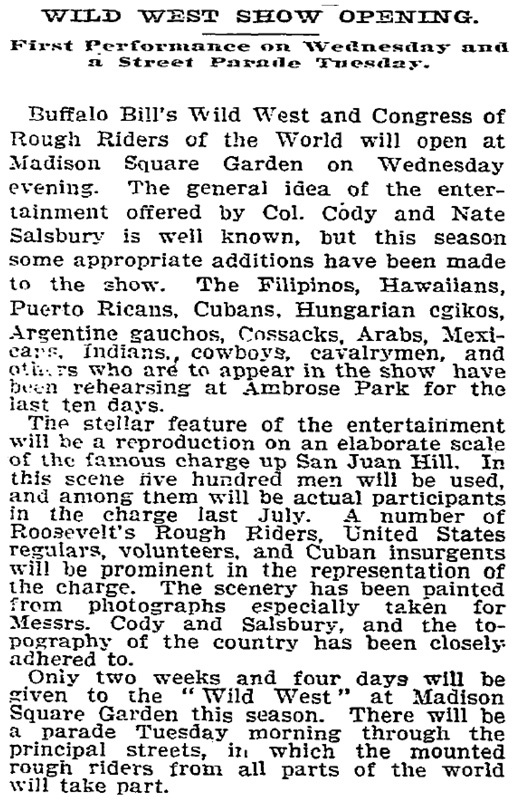 The Filipinos, Hawaiians, Puerto Ricans, Cubans, Hungarian cgikos,  Argentine gauchos, Cossacks, Arabs, Mexicans, Indians, cowboys, cavalrymen, and others who are to appear in the show have been rehearsing at Ambrose Park for the last ten days. The stellar feature of the entertainment will be a reproduction on an elaborate scale of the famous charge up San Juan Hill. In this scene five hundred men will be used, and among them will be actual participants in the charge last July. A number of Roosevelt's Rough Riders, United States regulars, volunteers, and Cuban insurgents will be prominent in the representation of the charge. The scenery has been painted from photographs especially taken for Messrs. Cody and Salsbury, and the topography of the country has been closely adhered to. Only two weeks and four days will be given to the "Wild West" at Madison Square Garden this season. There will be a parade Tuesday morning through the principal streets, in which the mounted rough riders from all parts of the world will take part.